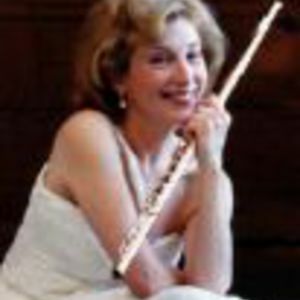 Paula Robison is an American flutist who has appeared as soloist with the New York Philharmonic and co-founded the Chamber Music Society of Lincoln Center. She plays on a Brannen-Cooper flute. Born in Tennessee and raised in California, Robison began playing flute early on, and by 19 she was studying at the Juilliard School, debuting with the New York Philharmonic the next year. Robison has performed on Live from Lincoln Center and Christmas at Kennedy Center. Since 1991, Robison has taught at the New England Conservatory of Music. Born in Tennessee and raised in California, Robison began playing flute early on, and by 19 she was studying at the Juilliard School, debuting with the New York Philharmonic the next year. Robison has performed on Live from Lincoln Center and Christmas at Kennedy Center. Since 1991, Robison has taught at the New England Conservatory of Music. When Jean-Pierre Rampal called in sick for his March 1999 appearance with the Detroit Symphony Orchestra in Mozart's K. 313 Flute Concerto, Robison substituted at the last minute.